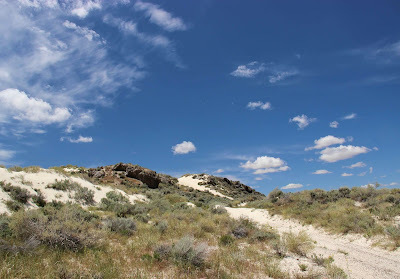 If you've read my recent posts (1), you know that in May I visited Utah’s Black Rock Desert volcanic field. But volcanics weren’t the only attraction. Lake Bonneville was just as obvious, fascinating and demanding of attention. As recently as 15,000 years ago, this Ice Age lake covered much of western Utah. 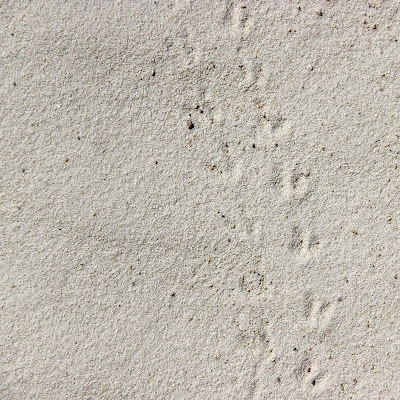 Now thick beds of sediments obscure volcanic evidence, and brilliant white playas—Bonneville’s desiccated remains—flash in the sunlight. One afternoon we visited a special playa near the south end of the old lake. It’s made of gypsum, and the rhyolite dome at the north end is nearly buried in gypsum sand. Gypsum (calcium sulfate dihydrate, CaSO4·2H2O) is a common mineral generally found in evaporite beds associated with sedimentary rocks. Where it occurs in large quantities, it’s mined (2). It’s used mainly for plaster and drywall (aka sheet rock, wallboard), as well as other less common but important applications. 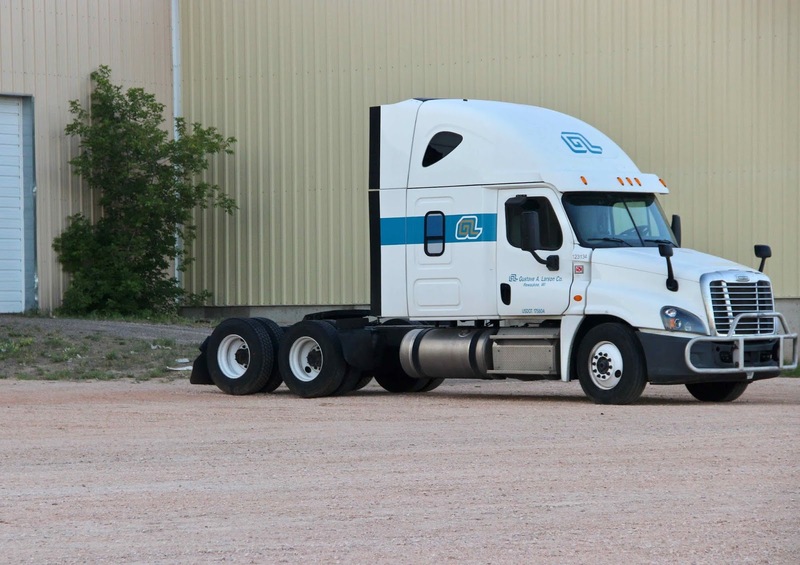 Gypsum forms through evaporation, crystallizing out of increasingly concentrated solutions. Therefore it dissolves easily in water, and rarely lasts long enough to form sand. The most notable exception is the 700 sq km White Sands dunefield in New Mexico, the largest accumulation of gypsum sand in the world. It’s said to contain enough gypsum to meet global drywall demand for the next thousand years. Fortunately commercial exploitation was nipped in the bud in 1933, when President Herbert Hoover designated the dunes a national monument. 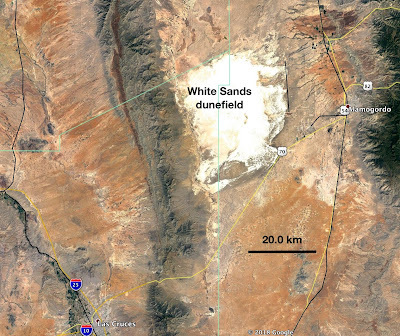 Google Earth view of White Sands National Monument, New Mexico; note scale. Google Earth view of White Mountain in the Black Rock Desert, Utah; note scale. 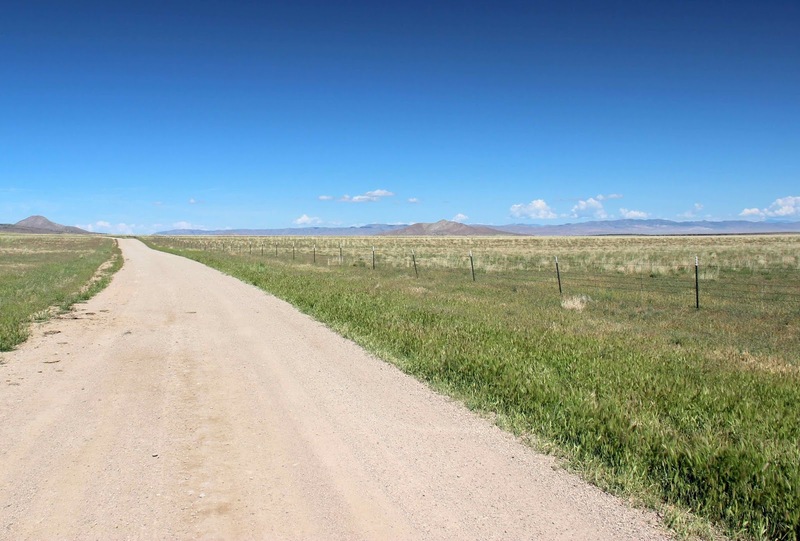 The White Mountain dunefield is tiny, but there’s enough of interest to justify a stop. And there’s little to interrupt ones reverie. 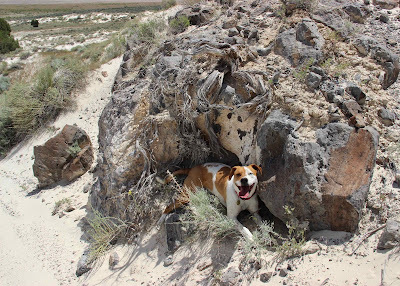 On a warm day midweek in May, the only visitors were myself, my dog and the spirit of Grove Karl Gilbert, my favorite pioneering geologist. 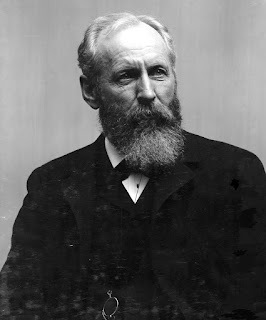 GK Gilbert, “one of the greatest American geologists of the 19th century—a man who should be ranked with Lyell, Agassiz, and Smith” (National Academy of Sciences Archives photo, from Picard 2008). From 1871 to 1879, Gilbert served as geologist on two of the Great Surveys of the American West, working for both Lt. George Wheeler and John Wesley Powell. 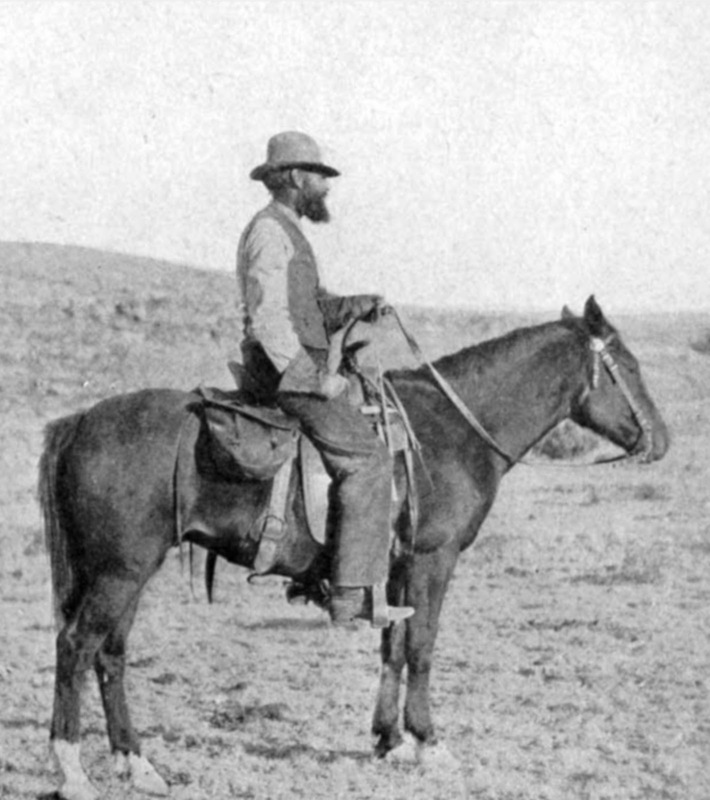 He loved field work, in spite of (or maybe because of) the rigors of western exploration (3). He had a sharp and creative mind, and his contributions to geology are legendary, for example discovery of laccoliths, comprehensive description and mapping of Ice Age lakes, and development of some of the most basic concepts in geomorphology. 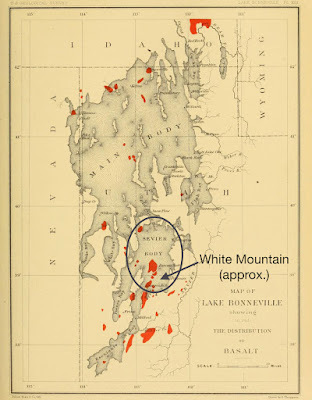 Lake Bonneville (Gilbert 1890); added circle and arrow mark Sevier Body and White Mountain. 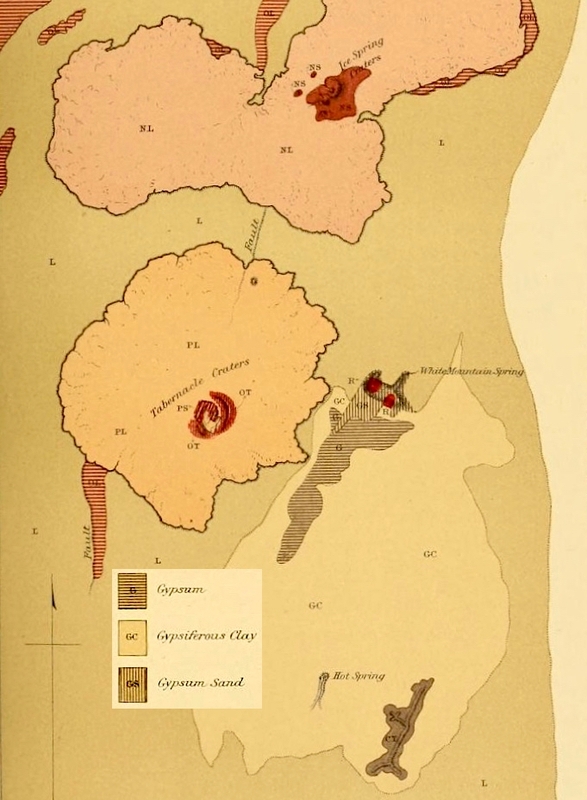 Partial map, from Gilbert’s 1890 Lake Bonneville monograph. 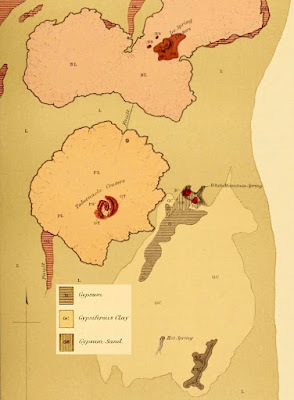 The map above shows the southern part of the “Volcanic District near Fillmore, Utah” (today’s Black Rock Desert) with the playa of gypsiferous clay (GC, pale yellow) and crystalline gypsum (G, horizontal hatching). 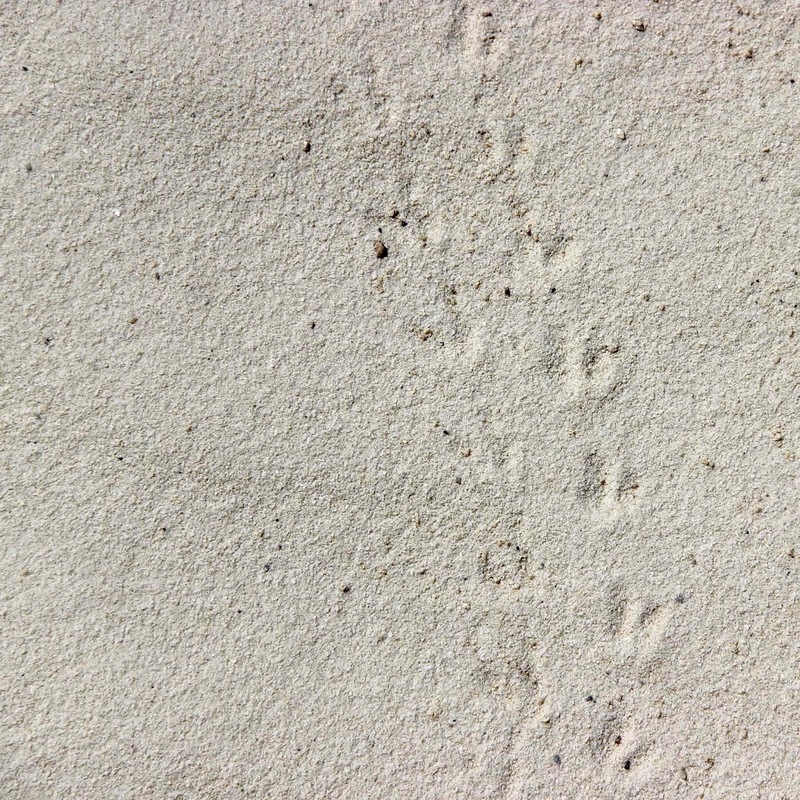 At the north end is White Mountain—rhyolite (R, red dots) and accumulations of gypsum sand (GS, vertical hatching). 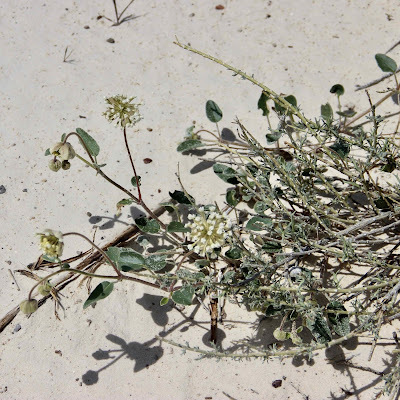 White sand verbena, Abronia elliptica. 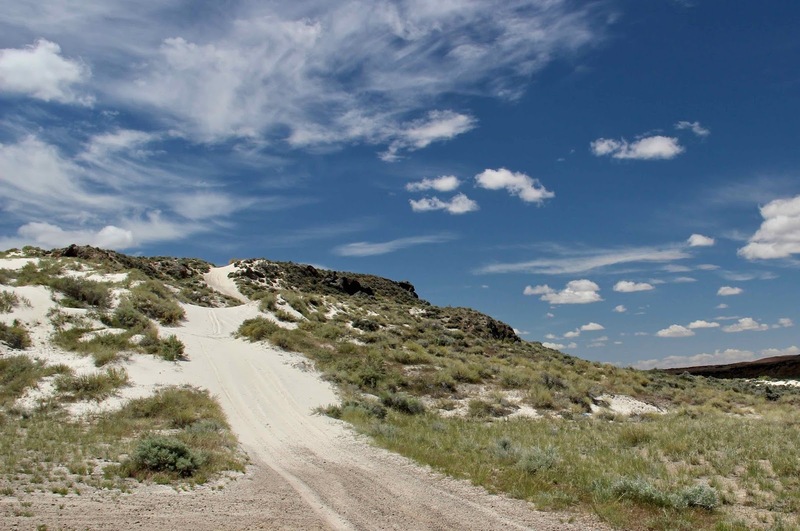 White Mountain is underpinned by a “small” rhyolite dome that erupted about 400,000 years ago. Its actual size is unknown due to overlying Lake Bonneville sediments and basalt flows. 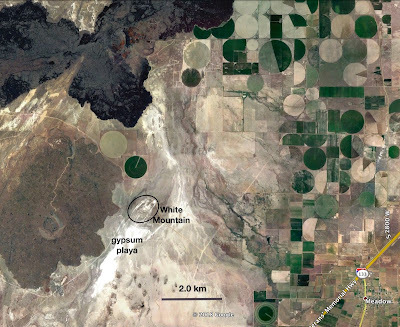 The White Mountain rhyolite may be significantly more extensive below the surface, as blocks have been found in the Tabernacle volcanic field to the west, active just 12,000 years ago (Johnsen 2010). View from White Mountain summit: lava flow and cinder cone, with Pavant Butte behind. 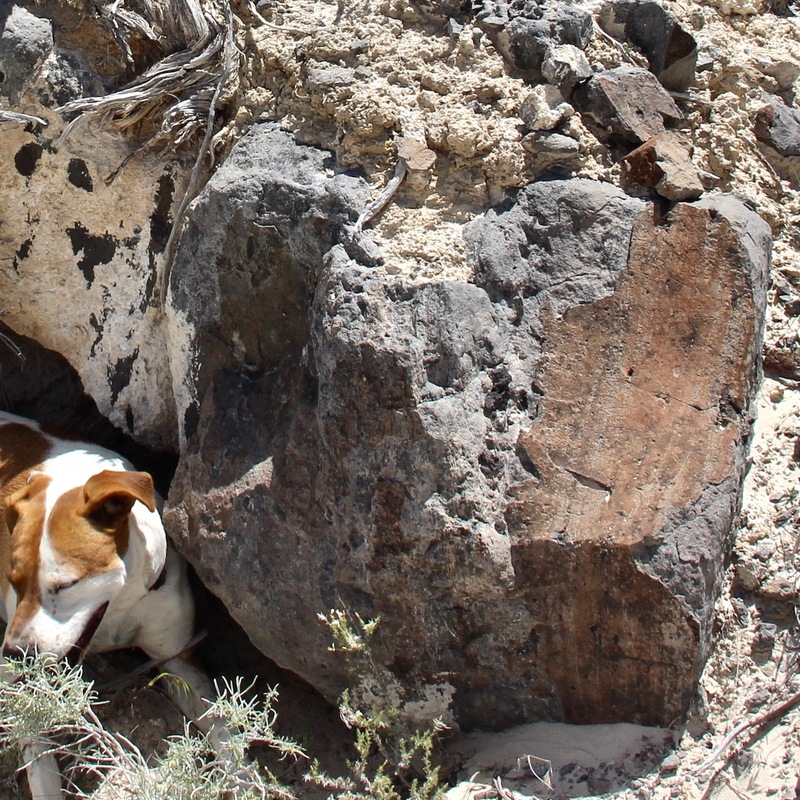 Enjoying a bit of shade provided by White Mountain rhyolite. Closer view, note layering … ?? Grove Karl Gilbert c. 1910; USGS photo. In my readings for this post, I learned that sometime before 1906, Gilbert met and fell in love with the great California botanist Alice Eastwood, probably on a Sierra Club outing. Plants and rocks—a wonderful match! In 1917, after a decade of "courtship," they made plans to marry the next year. Sadly, Gilbert died on May 1, 1918. 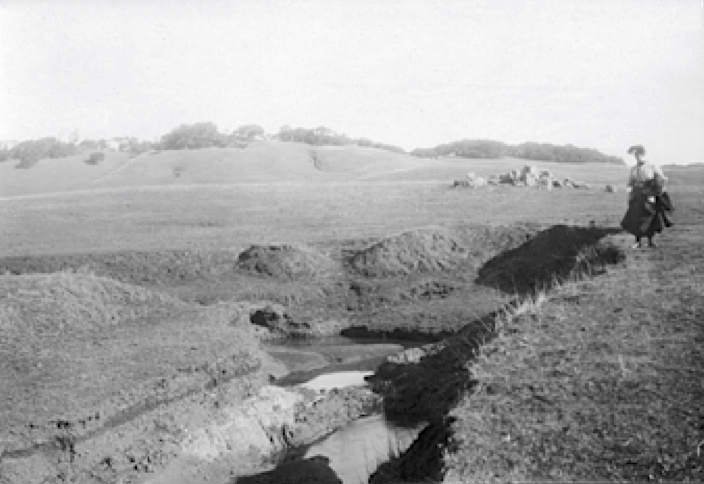 Alice Eastwood next to “rift” from the 1906 San Francisco earthquake (Marin County, GK Gilbert photo; Archives of the California Academy of Sciences, see Aldrich et al. 2006). 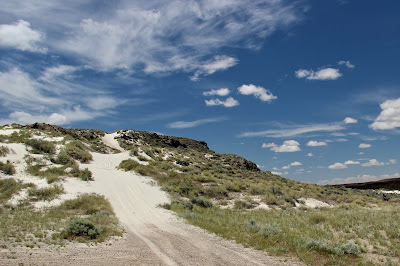 (1) Previous Black Rock Desert posts include Volcanoes in Utah—how can that be? !, Sunstones at Sunstone Knoll and A Caldera Lake? (2) Flue-Gas Desulfurization (FGD) gypsum now equals natural (mined) gypsum in wallboard manufacturing. FGD gypsum production utilizes emissions captured from fossil-fuel power plants. 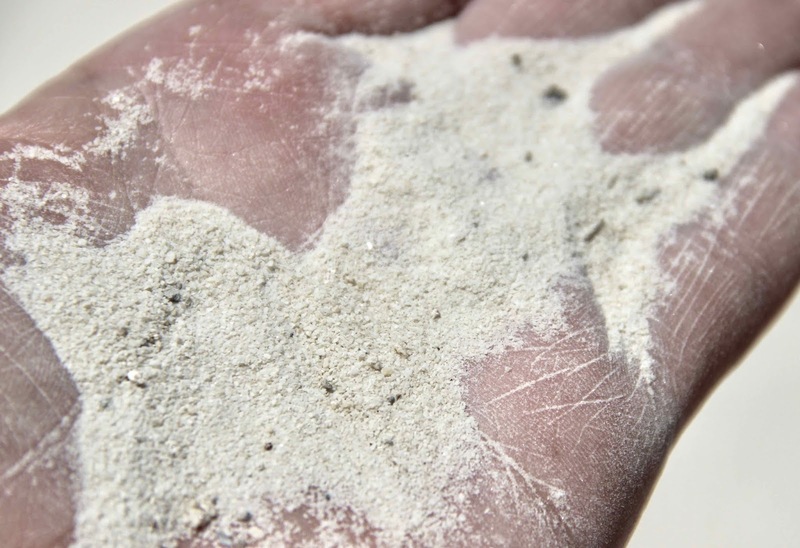 The product is chemically identical to natural gypsum, but with higher purity (more here). (3) Ironically, Gilbert was a sickly child, and even at 20 was frail enough to be passed over in the Civil War draft. Apparently field work changed him dramatically. 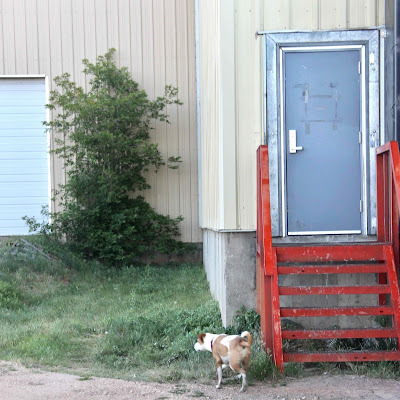 Gilbert, GK. 1890. Lake Bonneville. 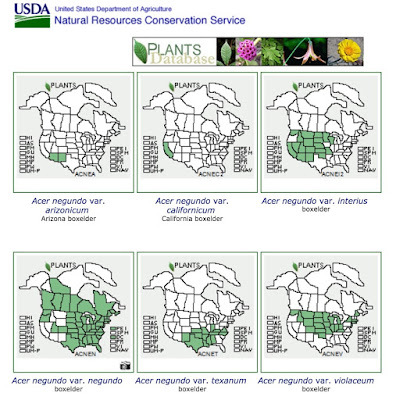 Monographs of the US Geological Survey, v. 1. Available here. Jenkins, MC. 2018 (January 8). Grove Karl Gilbert, ‘A Captain Bold’ National Geographic blog. Johnsen, R, et al. 2010. 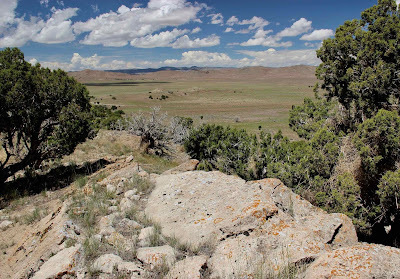 Subalkaline volcanism in the Black Rock Desert and Markagunt Plateau volcanic fields, in Carney, SM, et al., eds., Geology of south-central Utah. Utah Geological Association Publication 39. Picard, MD. 2008. Grove Karl Gilbert, master of laccoliths and lakes, in Profiles of Rocky Mountain geologists, a continuing series. Rocky Mountain Geology 43:111-118. Sepp, Siim (Sandatlas). 2015. Gypsum sand. Twin Peaks on horizon—South Twin Peak on left, North on right. 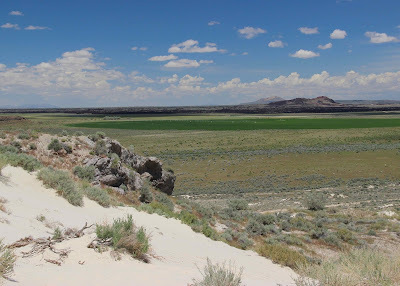 Near the end of our visit to the Black Rock Desert volcanic field, we drove west from Kanosh, Utah on a gravel road to Twin Peaks, looking for an ancient lake. 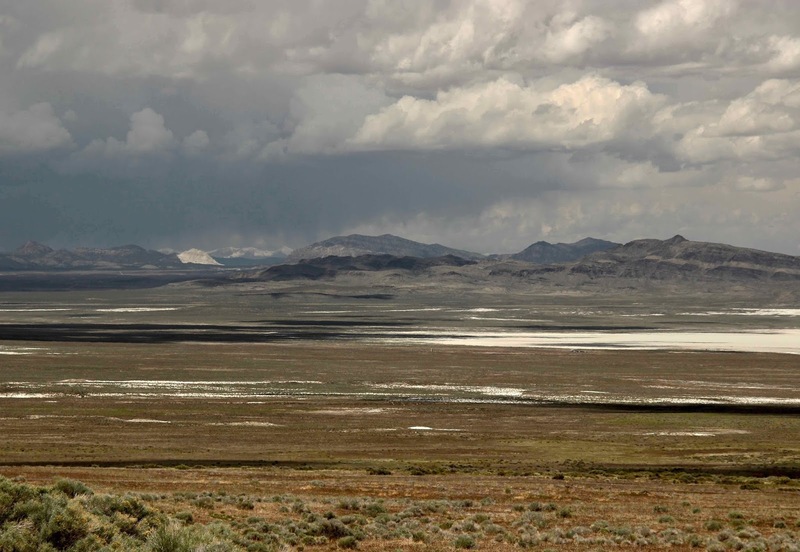 This was not Lake Bonneville, the great lake that still covered the Black Rock Desert just 15,000 years ago; its remains are widespread and easy to find. This was an older lake—one with no name and of uncertain origins. Sevier Lake/Playa (depending on rainfall) is what’s left of the Sevier Arm of Lake Bonneville. For this post, we’ll call it “Twin Peaks Lake” or TPL, even though it predates both North and South Twin Peaks (more on this later). It was at its height about 2.6 million years ago—a roughly semicircular lake perhaps 90 m deep. Now all that’s left is lithified limey lake muck—freshwater limestone and other calcareous rocks. 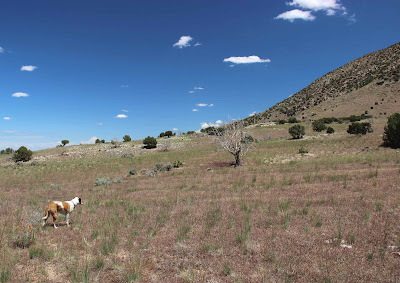 This is what I hoped to find, and during the initial drive-through, I noted areas with pale outcrops for further investigation. I was guided by a geological map made by Johnsen and colleagues (2014) after extensive field work and rock/element analyses. 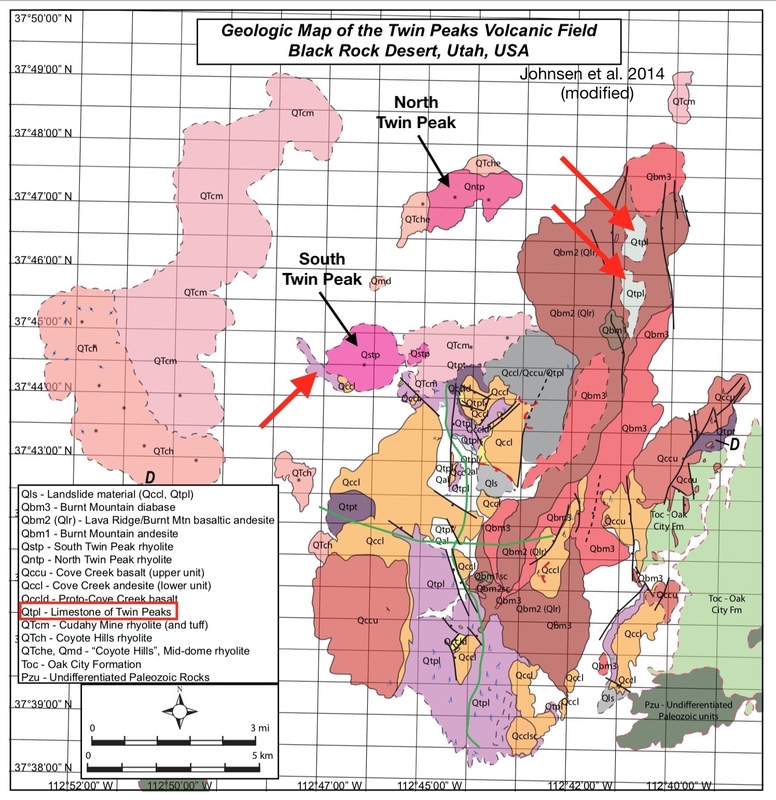 Two map units, gray and lavender, mark the limestone of Twin Peaks (Qtpl); the white unit (Qtpl/al) also includes limestone. Added red arrows mark areas searched—we found limestone at all. My field assistant was happy to investigate whatever wherever. 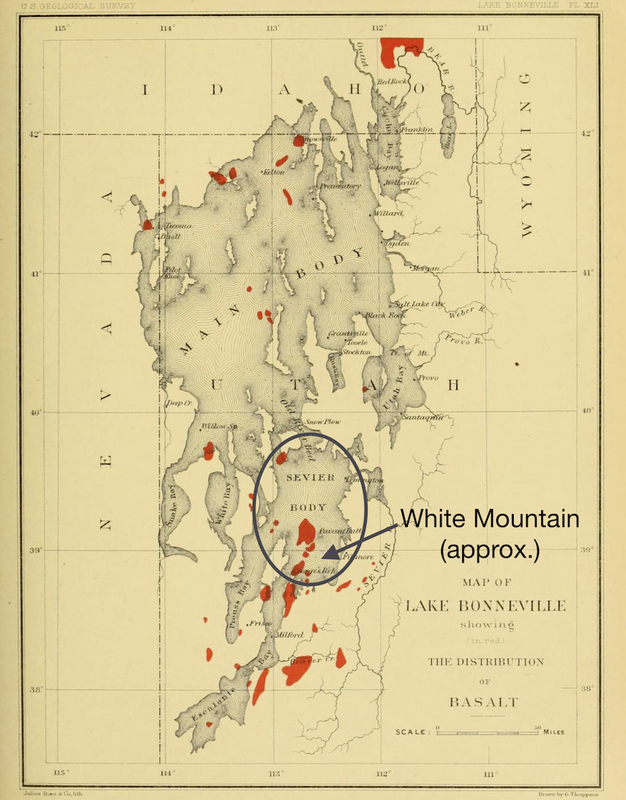 The limestone of Twin Peaks consists largely of reworked volcanic tuff and other pyroclastic debris, which is held together with limy cement (calcite) and interbedded with freshwater limestone. Apparently there were active volcanoes nearby; based on the nature of the sediments, at least some of the eruptions were large and violent. At the time of Twin Peaks Lake, the Black Rock Desert (BRD) volcanic field had been active for about four million years. Also at that time, activity was increasing significantly; most BRD volcanoes erupted during the last 2.5 million years, the youngest just 700 years ago. 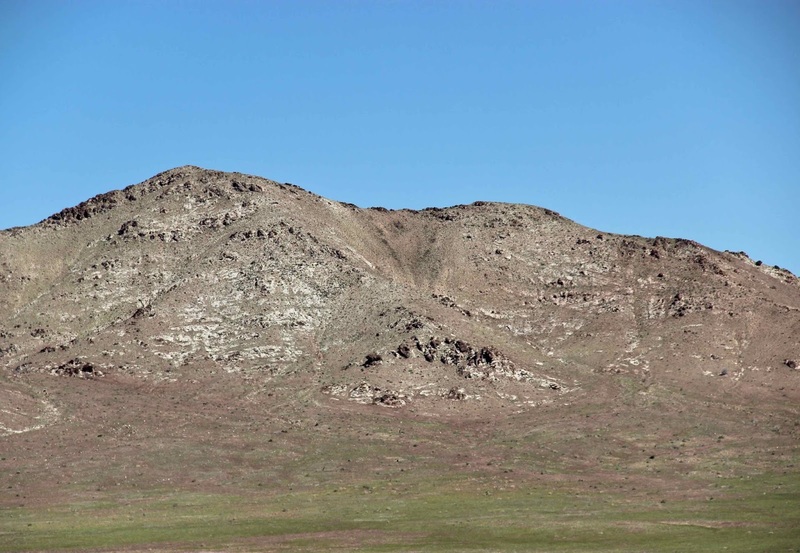 Activity was bimodal, with both “quiet” basalt flows, and spectacular eruptions of more silicic lavas—a “complete range of rock types from basalt to high-silica rhyolite” (Johnsen et al. 2010). Arrow points to Twin Peaks, near the south end of the BRD volcanic field. The Twin Peaks field (1) included two pulses of bimodal magmatism. The first appears to have been more violent, producing ash-flow tuffs as well as rhyolite domes and basalt flows. Twin Peaks Lake dates from the end of this period, when depletion of the magma chamber caused subsidence or collapse at the surface, producing a basin (Johnsen et al. 2014). But TPL lasted only 100,000 years or so. Its limestone and an overlying basalt flow were tilted during uplift of a dome. There’s no obvious explanation for the localized upwarping; perhaps a shallow silicic intrusion lies below (gravity survey ruled out mafic intrusions). Volcanic activity also resumed, a second magmatic pulse, again bimodal. This is when the Twin Peaks came to be—both are rhyolite domes. 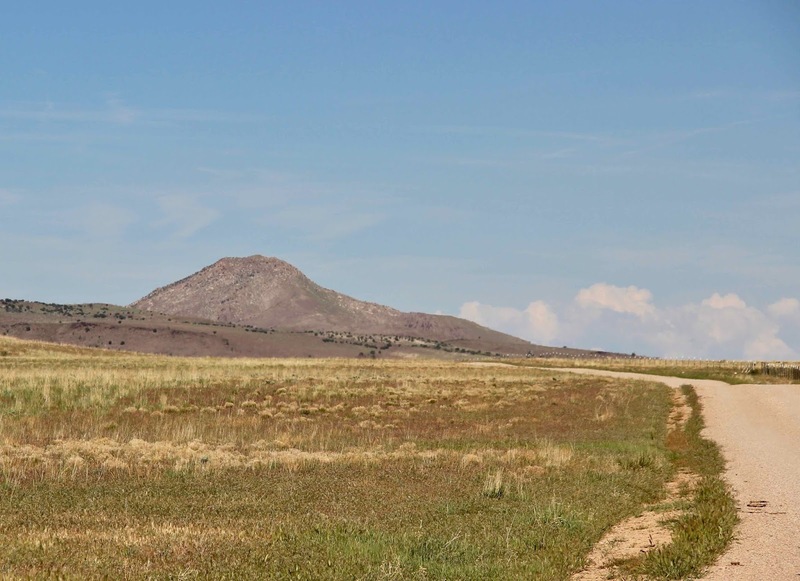 The Twin Peaks field ended its performance about two million years ago, with a compound cinder cone and several basalt flows as its final act. South Twin Peak, from east. North Twin Peak, from south. If you’ve visited Valles Caldera National Preserve in New Mexico, or Crater Lake National Park in Oregon, or some other classic caldera, this story probably sounds familiar: explosive high-volume eruptions; collapse or subsidence; formation of a lake; resurgent doming; and a second episode of eruptions. 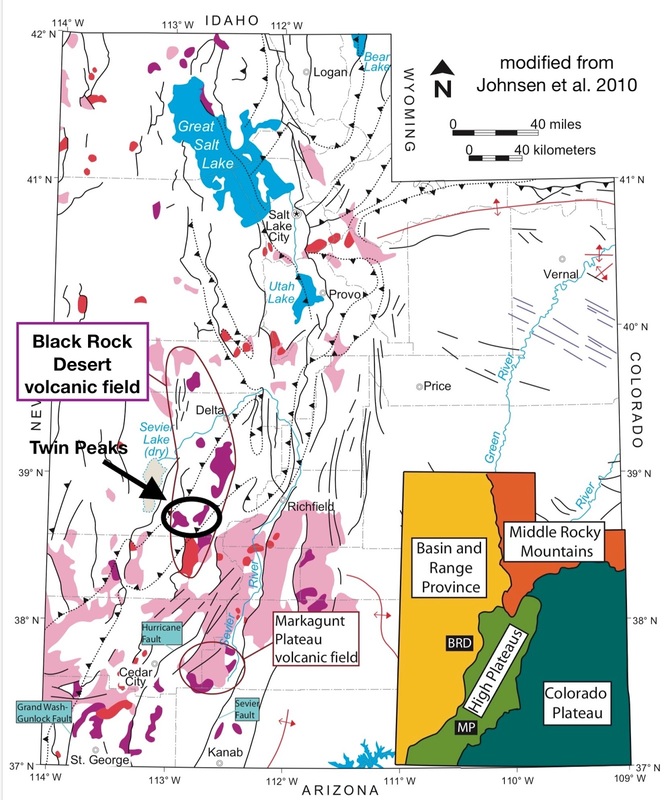 Indeed, Johnsen and colleagues (2014) found the evidence so compelling that they titled their paper “The 2.7–2.1 Ma Twin Peaks Caldera”. But there are problems with this interpretation. 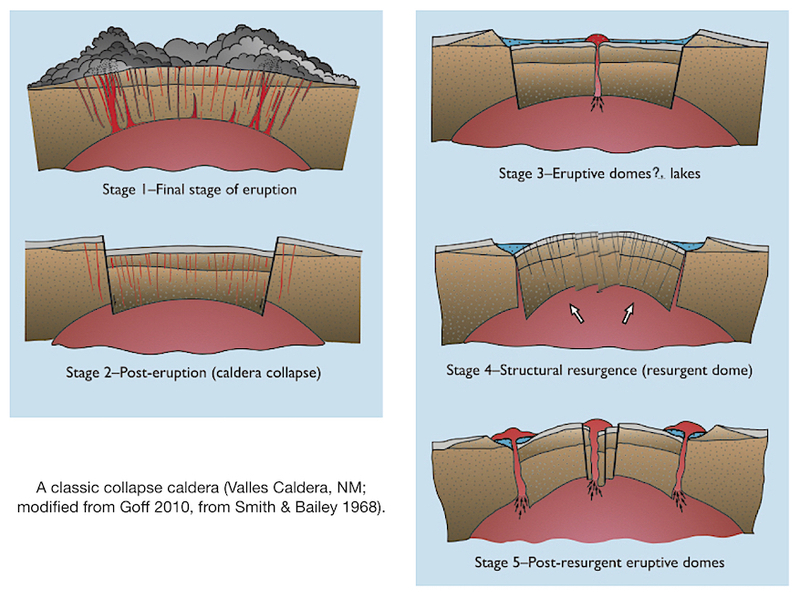 Stages of a classic collapse caldera. It’s true that most calderas are not as clear, straight-forward and perfect in form as the one above. Even so, it’s a bit of a stretch to call the Twin Peaks field a caldera. As Johnsen et al. note, several key features are missing. The volume of outflow during the first magmatic pulse seems low for caldera-producing eruptions; however, outflows may have spread over an area so extensive that thick deposits never formed. No obvious remnants of a caldera rim remain, but it’s possible that erosion and subsequent eruptions destroyed it entirely. 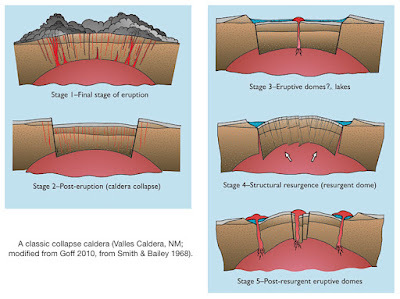 More problematic, there’s no evidence of the ring fracture characteristic of classic caldera collapse. 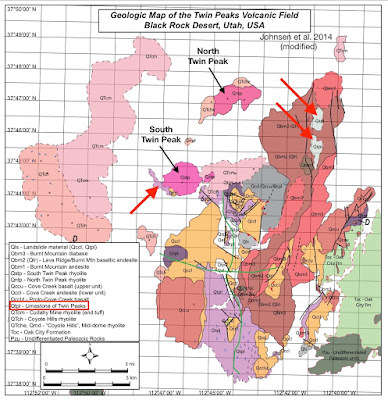 Finally, limestone outcrops are present only in the eastern part of the field (see geologic map above), suggesting TPL was not a typical circular caldera lake. 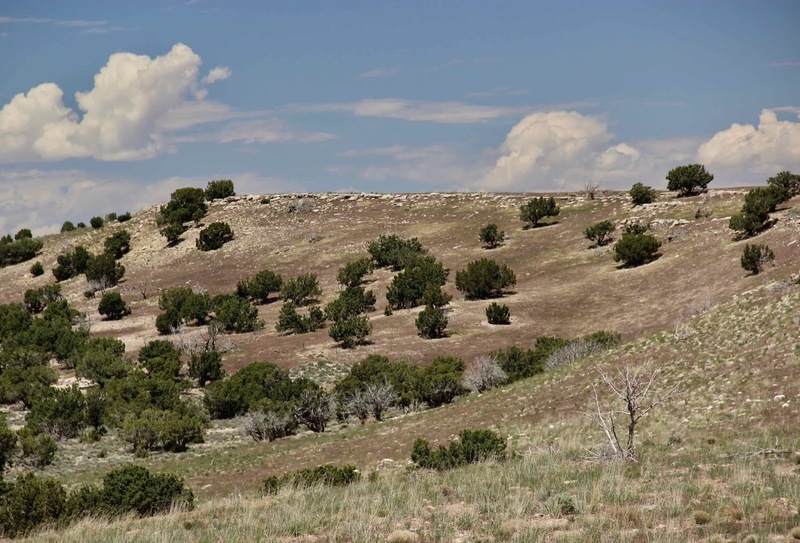 But collapse calderas—like the storybook Valles Caldera—are not the only kind. For example, subsidence can be caused by magma migrating away from the original vent(s). Given that the second pulse of Twin Peak magmatism took place mainly west and north of the first, this might be what happened. Or perhaps instead of catastrophic eruption and subsidence, the magma chamber was continuously depleted. “In short, the Twin Peaks volcanic field could be just a rhyolitic dome complex punctuated by a few mafic eruptions" … unfortunately, some evidence contradicts this scenario as well (see paper for more discussion). Obviously more work needs to be done (2). In my geo-tripping, the sites I visit generally have fascinating stories to tell—about how the Earth has changed, radically. I will never tire of peering into the deep past, and imagining landscapes so different from where I stand. These are destinations recommended by guidebooks, websites and friends—places where geologists have had some luck in deciphering the rocks and landforms, and can tell an engaging story. But a visit to a well-studied but poorly-understood feature such as the Twin Peaks volcanic field reveals that stories can be (often are?) elusive. Clues are hard to come by and contradictory. Diagnostic landforms were destroyed long ago. The rocks divulge little. We're left with only dim shadowy glimpses of a former world. One last view of Twin Peaks Lake, now capping a ridge. (1) Twin Peaks is considered a subfield of the Black Rock Desert volcanic field (Johnsen et al. 2010). (2) Johnsen et al. 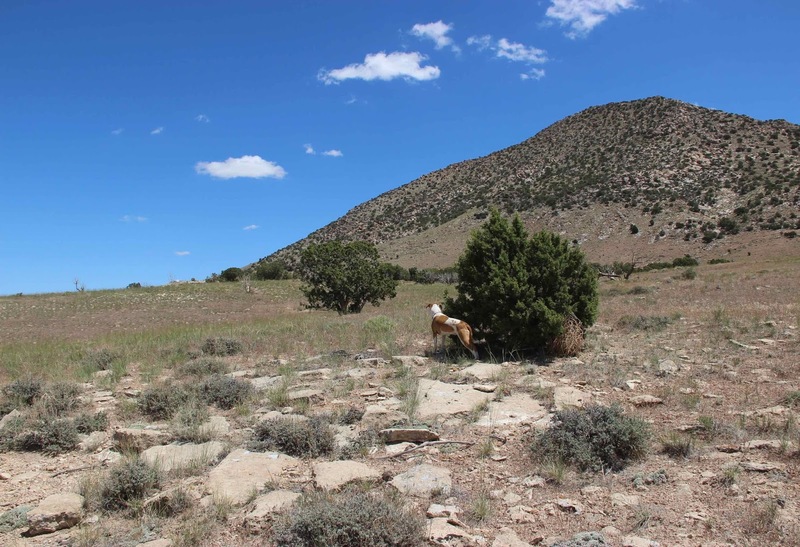 (2014) ended their paper with a section titled “Future Work” which included more mapping, more precise dating, and more rock and mineral analyses. Crecraft, WPN, and Evans, SH, Jr. 1981. 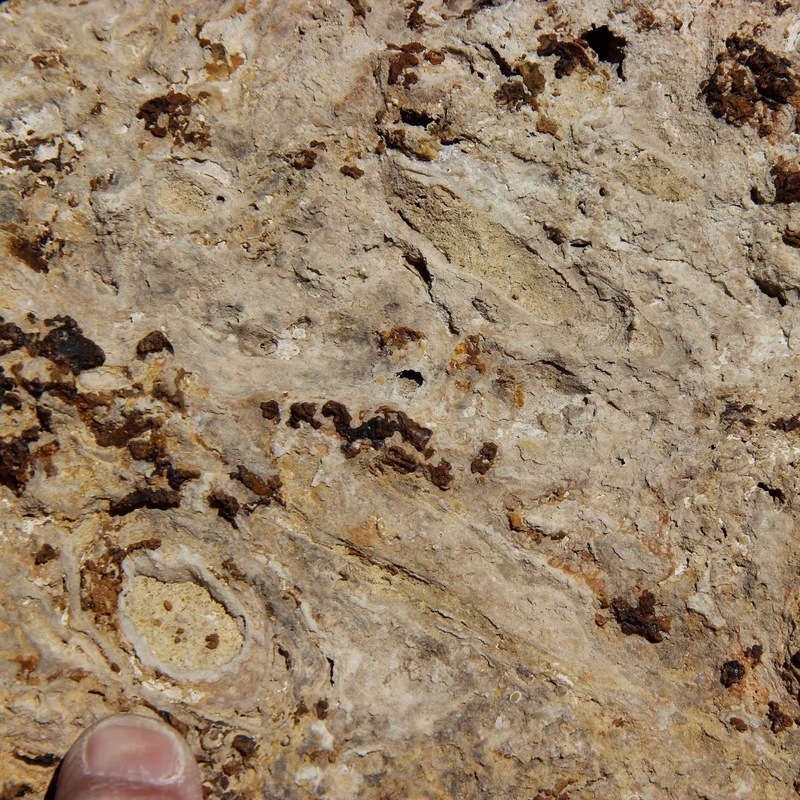 Cenozoic volcanism at Twin Peaks, Utah: geology and petrology. J. Geophys. Res. 86 (B11):10303-10320. Johnsen, R, Smith, EI, and Walker, JD. 2014. 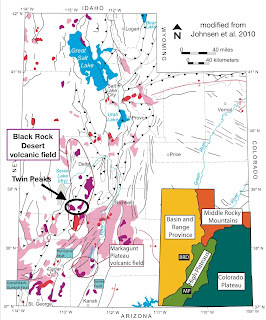 The 2.7–2.1 Ma Twin Peaks caldera—stratigraphy and petrogenesis, in MacLean, JS, Biek, RF, and Huntoon, JE, eds, Geology of Utah’s Far South: Utah Geological Association Publication 43: 617–638. Smith, RL, and Bailey, RA. 1968. Resurgent cauldrons. Geol. Soc. Mem. 116:613-662. 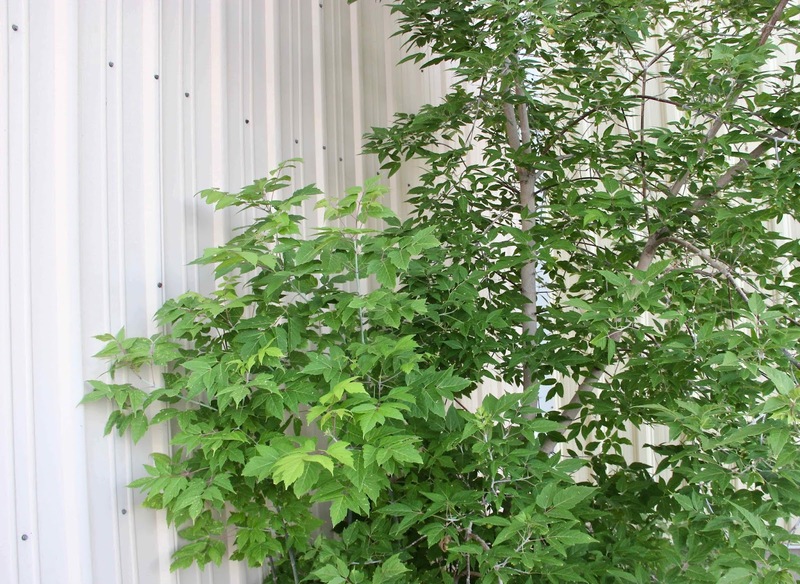 The boxelder I’m following this year, the one that grows in a nook formed by warehouse walls, has changed only subtly since last month’s report. It has more leaves—not that I’ve counted them or measured their cover, but I can see new ones emerging, even though the first signs of summer’s end have appeared. Must be an optimistic tree. The sand dock along the warehouse wall is done storing energy underground, and is now a brown tangle of dead leaves (Canada thistle sticking up through). 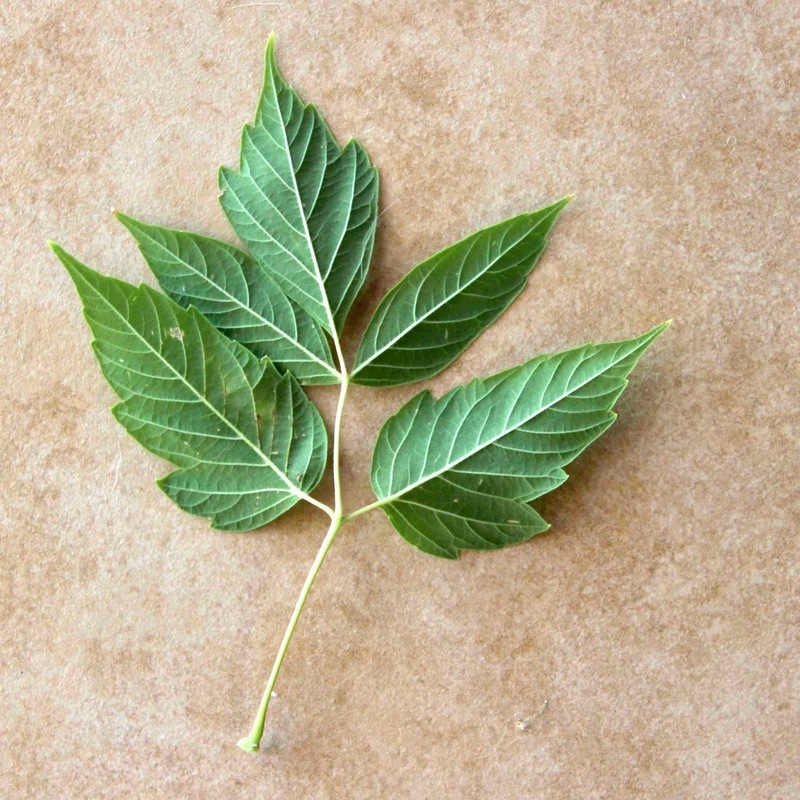 Boxelder’s oppositeness—stems as well as leaves. 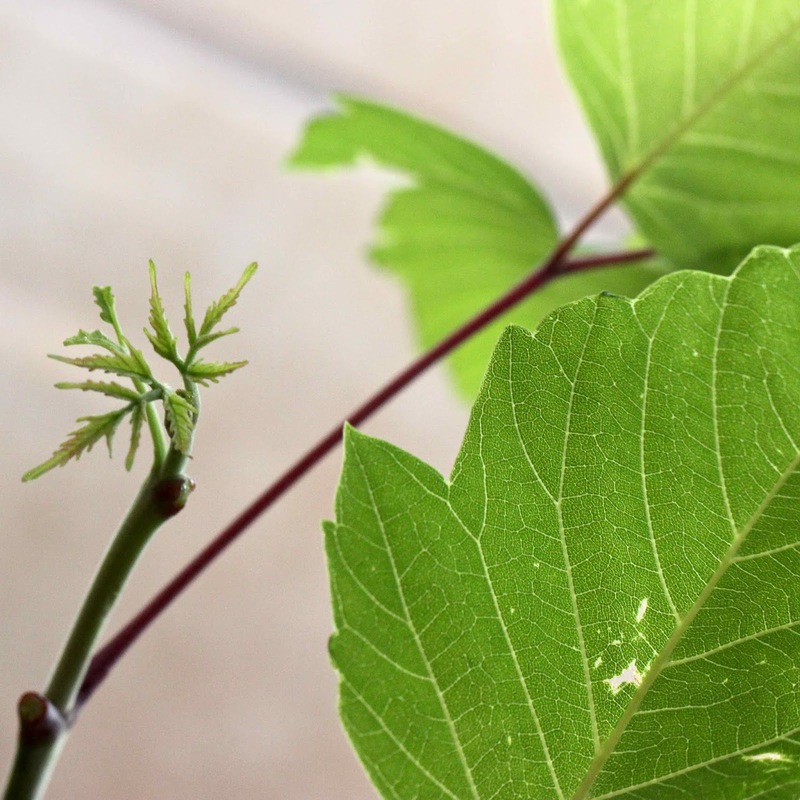 Fresh new leaves … in September! The miniature leaves emerging at the tips of the branchlets had interesting forms, surprising actually. But in the morning shade it was impossible to capture them in focus, so I took a branchlet home. Interesting! These two young leaves look deeply incised and pinnately-lobed (keep this in mind for the trick question coming up soon). Q: "How many leaves in the next photo?" A: "Just one." This is a little trick we ranger naturalists would use on nature walks. Most people would answer five. Then we explained how actually this is a single leaf, i.e., from one bud, and that it split into leaflets as it grew. 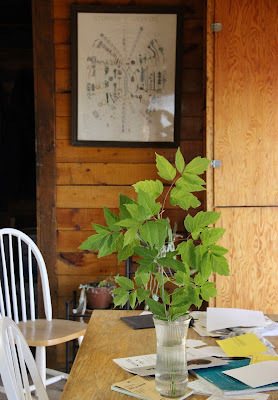 At least one former ranger I know took it a step further, overlapping the leaflets to show that the boxelder is indeed a maple, a member of the genus Acer. Even so, doesn’t it seem a bit odd that boxelder ended up in the genus Acer—that a tree with compound leaves was thrown into a group of simple-leaved brethren (1), especially given the proclivity of taxonomists for splitting? If you agree that this is odd, you’re not alone. 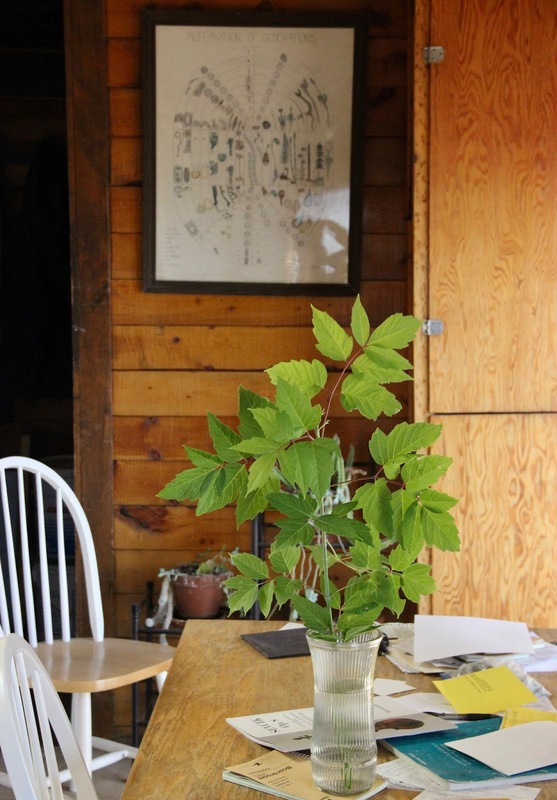 In fact, you’re in the company of some of the most esteemed pioneering North American botanists. So it's not surprising that Carl Linneaus included the boxelder in the first edition of his Species Plantarum (1753), in which he formally introduced our binomial system of nomenclature. 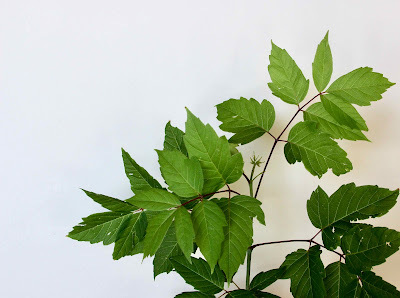 He assigned the scientific name in use today: Acer negundo (the complete name has “L.” appended to it because Linneaus is the authority). 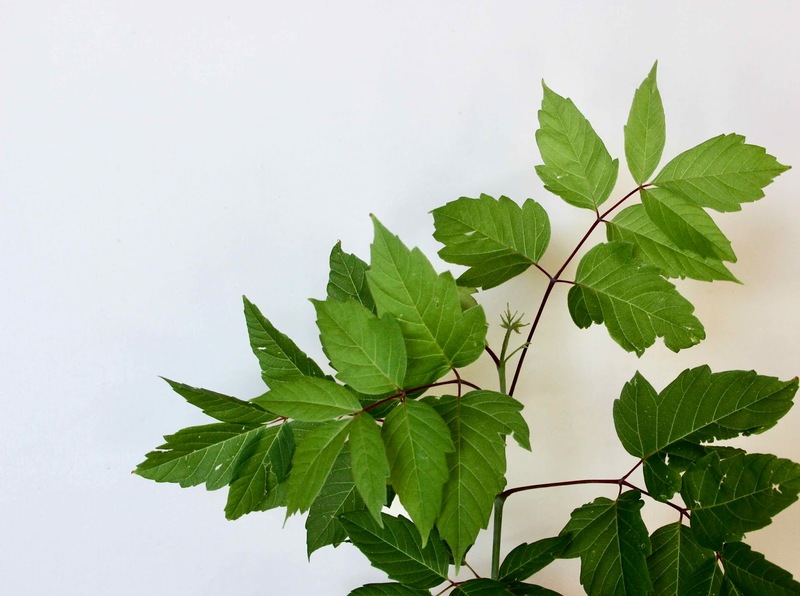 Why did he place boxelder in the genus Acer? 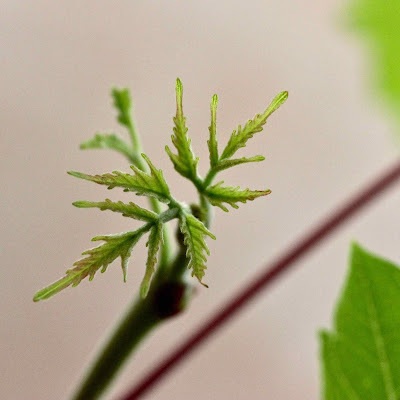 Probably because it has the same distinctive fruit as maples: two-winged two-seeded samaras that spin in the wind (aka wingnut, helicopter, whirlybird, whirligig and spinning jenny). 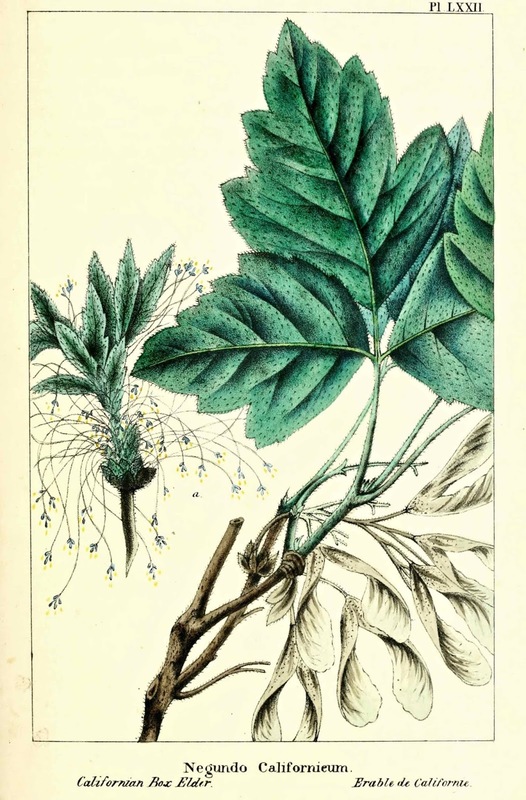 Acer negundo L. (Michaux & Hillhouse 1819); samaras (keys) lower left. 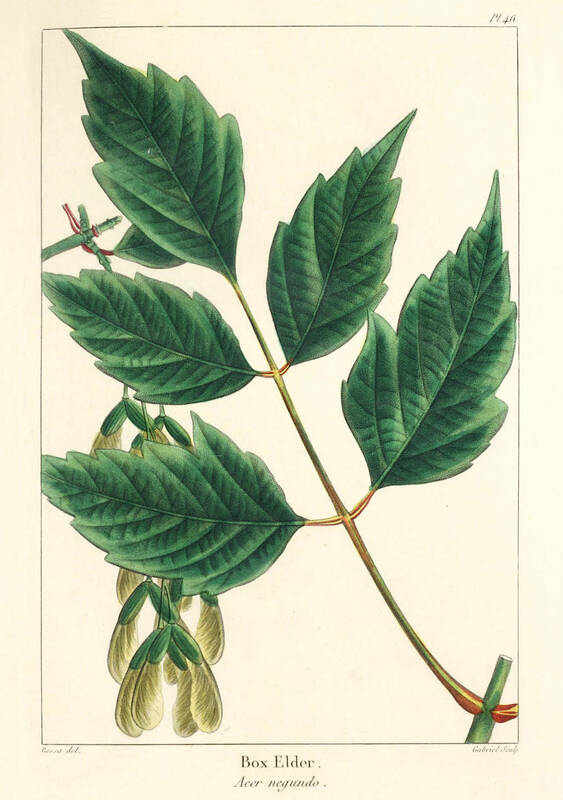 When Andre Michaux published the first North American sylva in 1810 (2), boxelder was Acer negundo, following Linneaus’s lead. 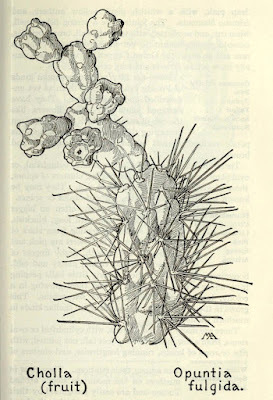 And so it remained for some thirty years, during which time Thomas Nuttall published periodic updates, adding new species that he and others discovered. But by the time of Nuttall’s 1849 edition, boxelder had moved up in status (see p 90). It was in its own genus, Negundo, the boxelders, which included two species and a rumored third. 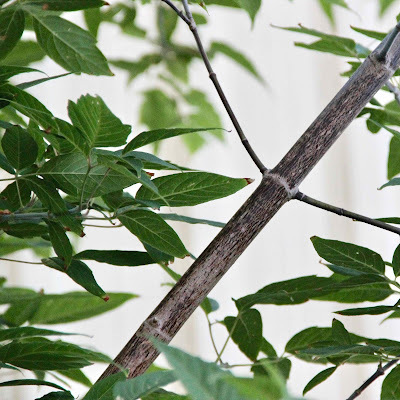 The common boxelder became Negundo aceroides. 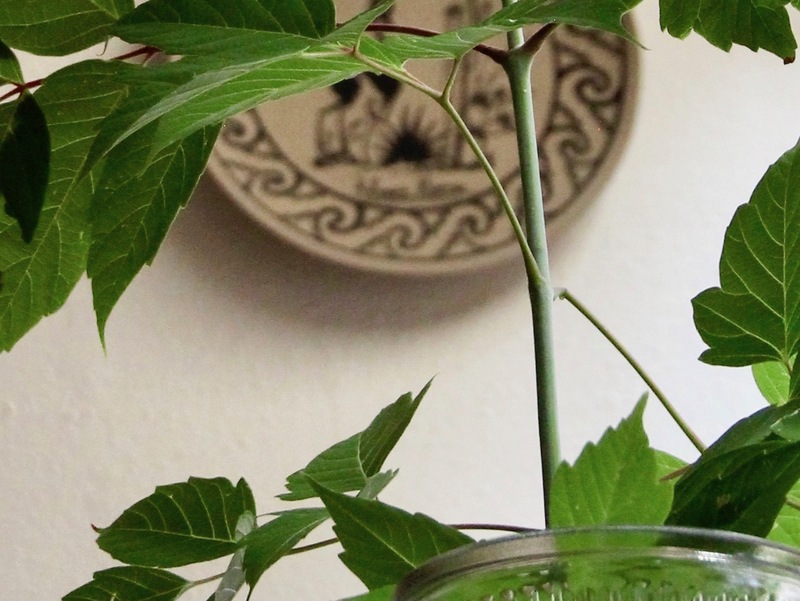 N. californicum was the California boxelder, discovered by David Douglas, a Scottish botanist and major contributor to the North American flora. 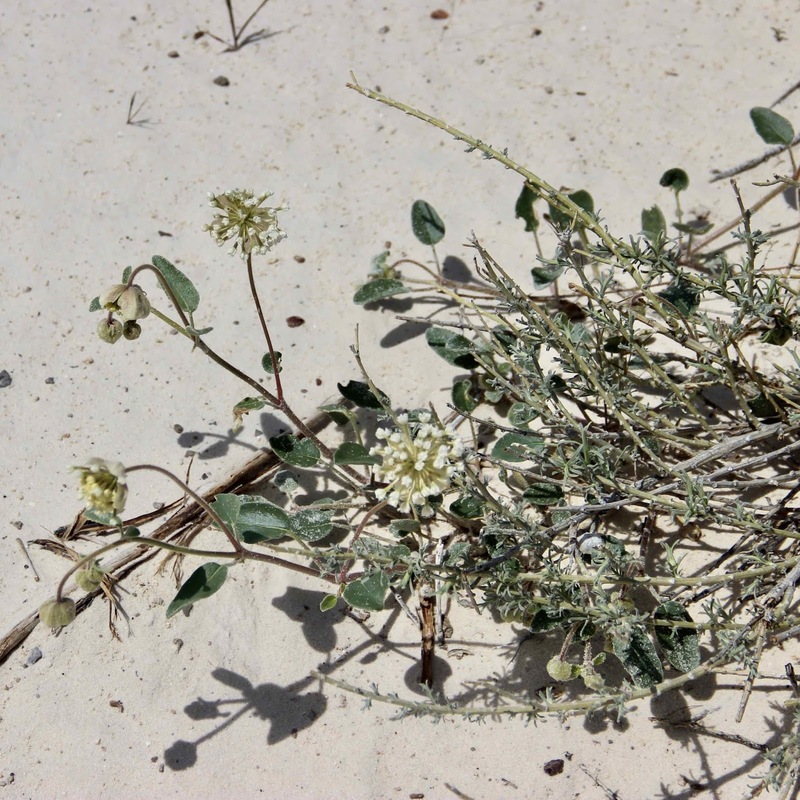 “It is remarkable for the almost tomentose pubescence of its leaves” (densely fine hairy), most of which had just three leaflets. Even the samaras were pubescent. 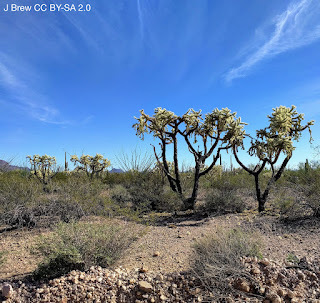 Nuttall also mentioned a possible third species, christened N. mexicanum by Swiss botanist Augustin Pyramus de Candolle (3), but declined to recognize it until more material was available for study. California boxelder, Negundo californicum (Nuttall et al. 1865). I had hoped to find out why the boxelders were segregated into their own genus. But I wasn't able to solve that mystery. 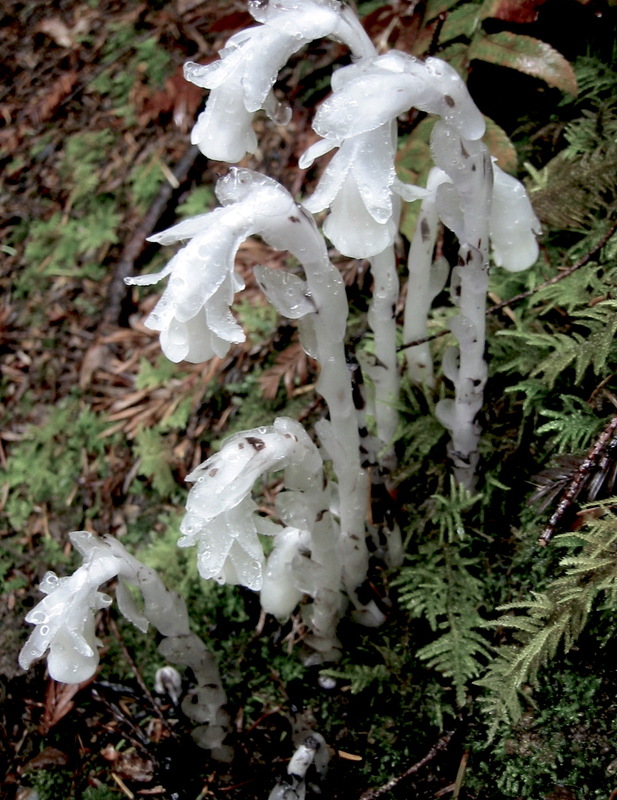 The Plant List considers Negundo aceroides an unresolved name, attributable to either John Torrey or Conrad Moench. Some sources hold Nuttall accountable as well. In any case, Torrey and Asa Gray, two of our great botanical luminaries, included it and N. californicum in their North American flora, published 1838-1840 (pp 49-50). 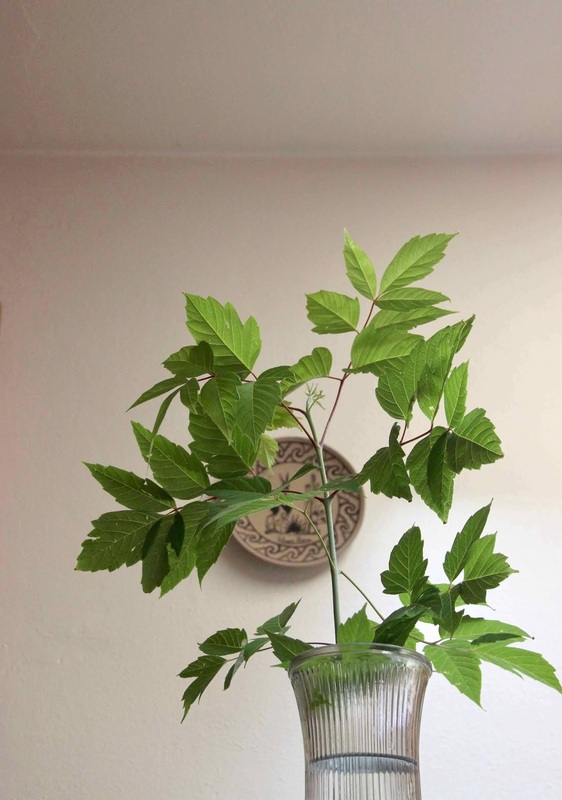 My boxelder is Acer negundo var. 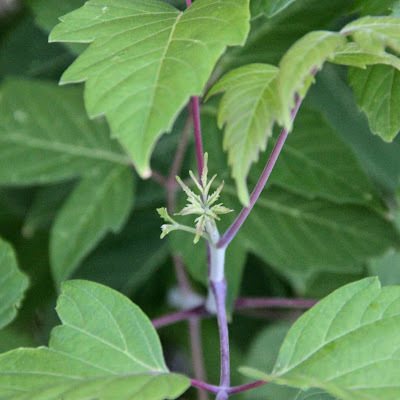 violaceum, because its branchlets are glabrous (no hair) with a glaucous bloom—hence the bluish-green stem in the photo below. 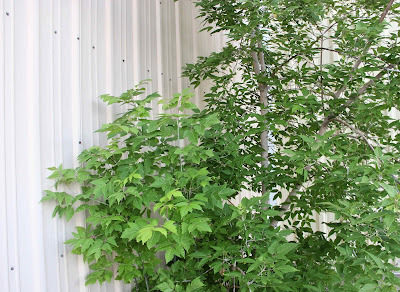 (1) Boxelder is not the only odd maple. 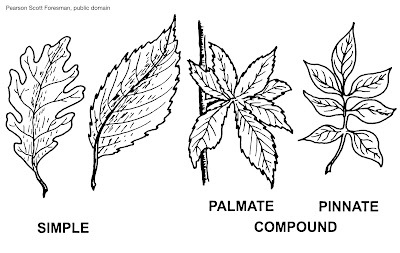 The great majority have simple lobed leaves, but there are several with either compound or simple unlobed leaves (details here). 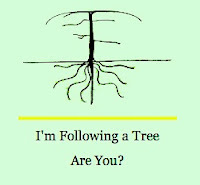 (2) A sylva is all the trees growing in a specific region; also “silva”. 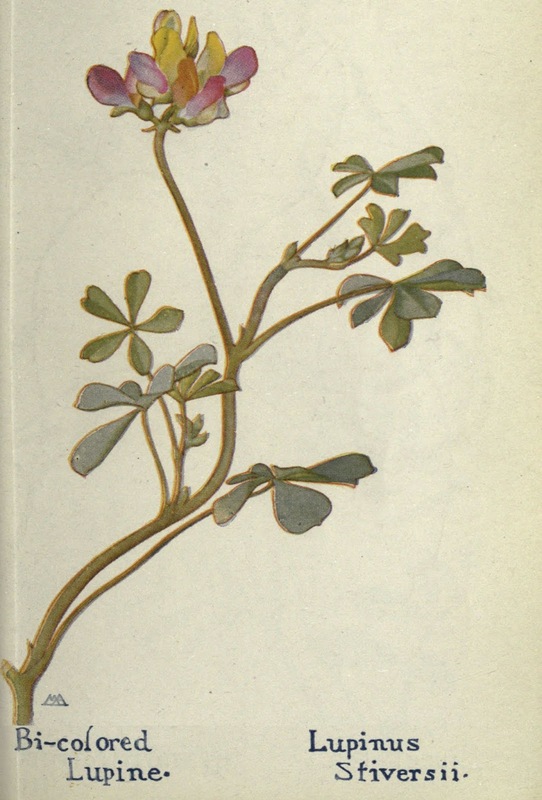 (3) Negundo mexicanum may have been based on material collected by botanist Jean-Louis Berlandier, a student of DeCandolle, who joined a Mexican scientific expedition in the late 1820s at the recommendation of his mentor (source). 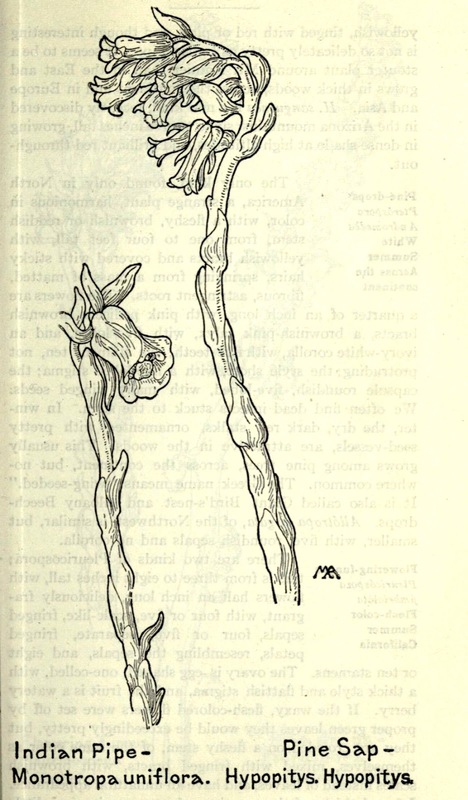 Biodiversity Heritage Library Flickr Album for The North American sylva v.2 (1865). Constantino, G. 2018 (March 29). Exploring the First American Silva. 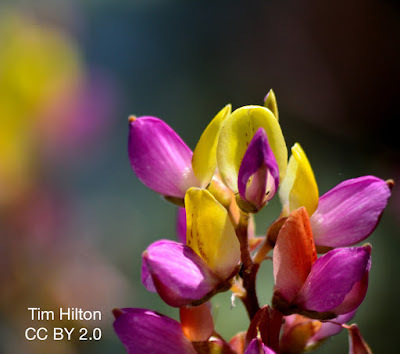 Biodiversity Heritage Library Blog. Michaux, FA, and Hillhouse, AL. 1819. 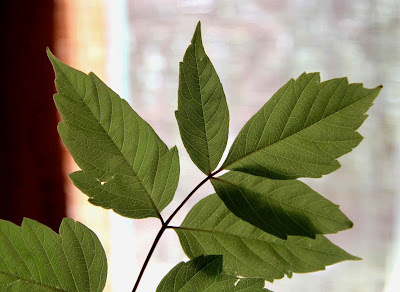 The North American sylva, or A description of the forest trees of the United States, Canada and Nova Scotia; considered particularly with respect to their use in the Arts , and their introduction into Commerce [English translation]. Paris, printed by C. D’Hautel. Available online at Biodiversity Heritage Library. Nuttall, T, Michaux, FA, and Smith, JJ. 1865. The North American sylva; or, A description of the forest trees of the United States, Canada and Nova Scotia. Considered particularly with respect to their use in the arts and their introduction into commerce, v. 2. Philadelphia, Rice, Rutter & co. Available online at Biodiversity Heritage Library. 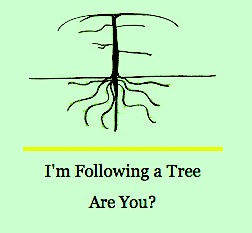 For more news about trees from various parts of the world, visit the monthly tree-follower gathering kindly hosted by The Squirrelbasket. New members always welcome! 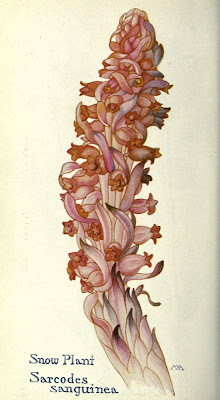 Margaret Armstrong often used plant motifs, in this case the Coast Range Mariposa Lily (1); source. By 1913, American graphic artist Margaret Armstrong had all but abandoned her successful career in cover design. 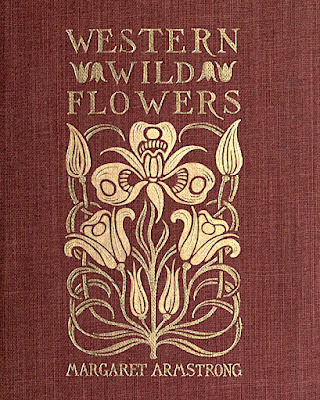 It's true that Art Nouveau, whose flowing undulating lines she found so inspiring, was falling out of fashion, and that cheaper printed paper dust jackets were replacing decorative covers. But these trends were largely coincidental. Armstrong gave up her career for a very different reason. 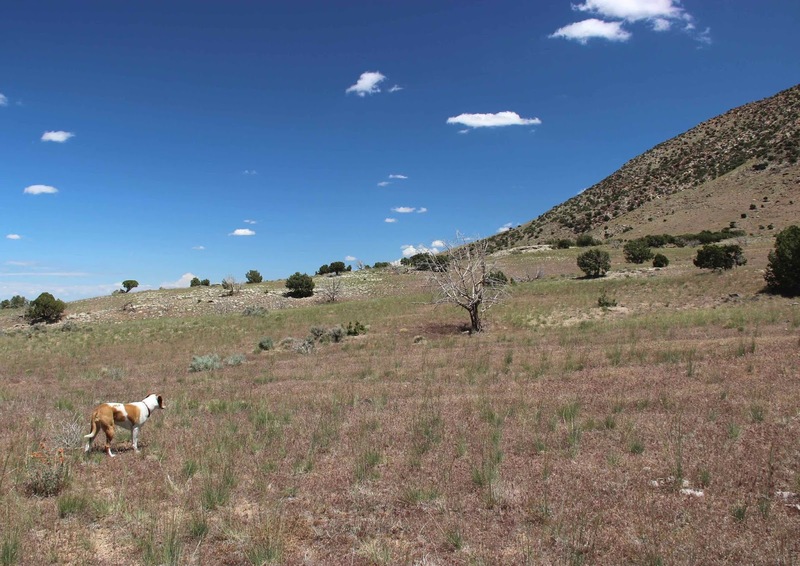 She was writing a book about her passion—the wildflowers of the American West. 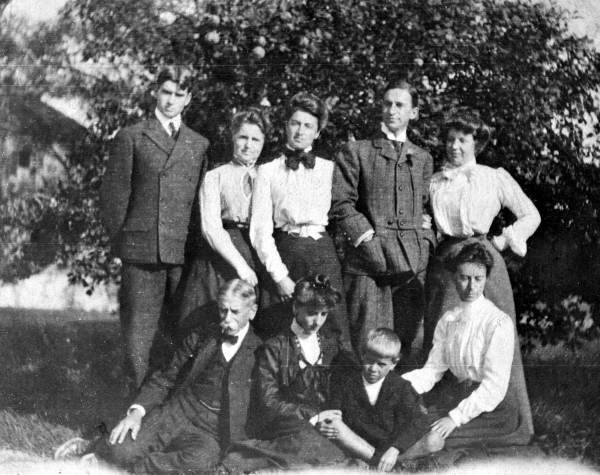 Armstrong family c. 1910s; Margaret lower right (source). Margaret Neilson Armstrong was born in New York in 1867 to a wealthy and artistic family. Her father, a diplomat, studied oil painting while in Italy, and also worked in stained glass, as did her sister Helen. 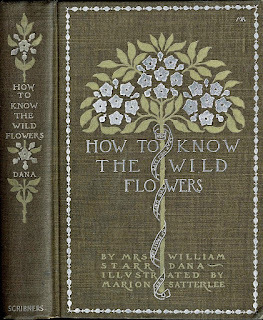 Margaret started her career as a graphic designer in the 1880s, and by 1890 was specializing in book covers and bindings. 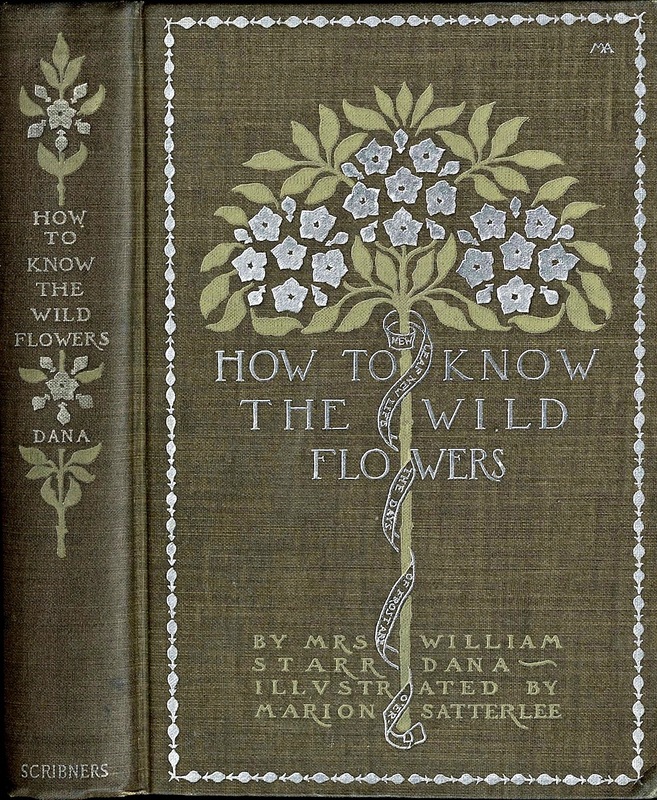 She produced covers in her popular distinctive style for at least 270 books, including works by well-known authors such as Washington Irving, Henry Thoreau, Henry Van Dyke and John Greenleaf Whittier, as well as the popular botany books of Francis Theodora Parsons (aka Mrs. William Starr Dana). Armstrong marked her covers with the monogram “MA” (upper right corner). Winding banner reads: "New leaf, new life, the days of frost are o’er" (source). 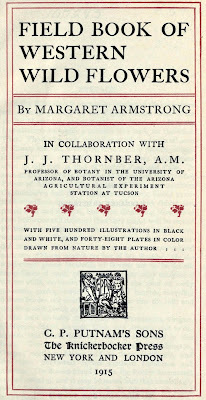 By 1908, Armstrong’s output began to decrease noticeably as she devoted more and more time to her passion for plants. 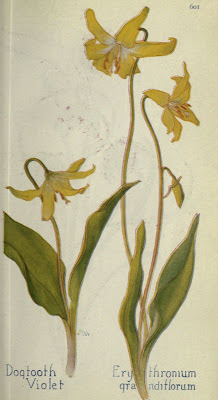 This wasn't terribly surprising to those who knew her, for she had been an enthusiastic naturalist since childhood (2). 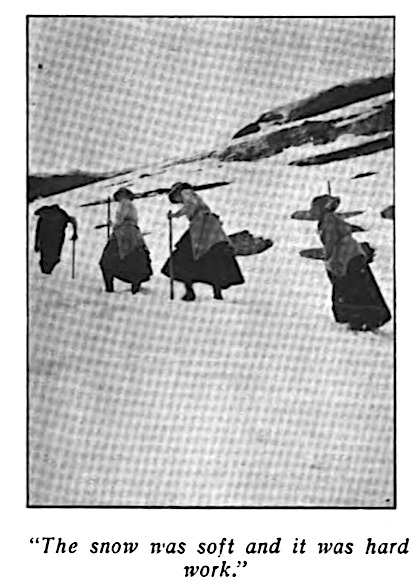 Things got exciting in 1911, when Armstrong (then in her mid-forties) and three gal friends toured the American West, seeking adventure as well as plants. They rode horses down into the Grand Canyon, and crossed the Victoria Glacier above Lake Louise to climb to the Mitre Col (see her 1912 article). While they weren’t the first women to accomplish these things (3), they were operating far outside the norm, and enjoyed themselves immensely for it. Armstrong continued to travel the western United States—studying, sketching and collecting wildflowers. 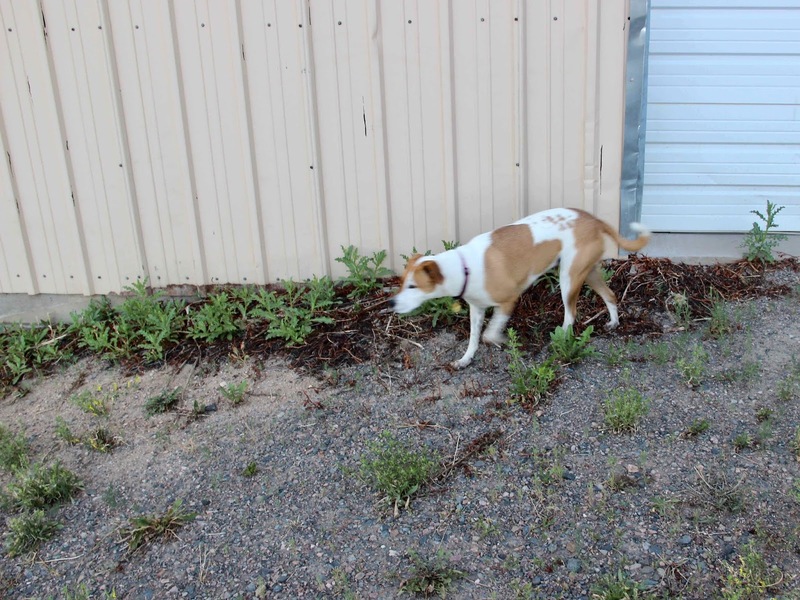 None of the existing field guides adequately covered the area west of the Rocky Mountains (4), and she was eager to produce one herself. But as she noted, “the field is vast, including within its limits all sorts of climate and soil, producing thousands of flowers, infinite in variety and wonderful in beauty, their environment often as different as that of Heine's Pine and Palm” (quotes here and below are from Armstrong's Field Book). Out of this multitude, she chose some 550 of the more common species for her book—from Washington, Oregon, Idaho, California, Nevada, Utah and Arizona. 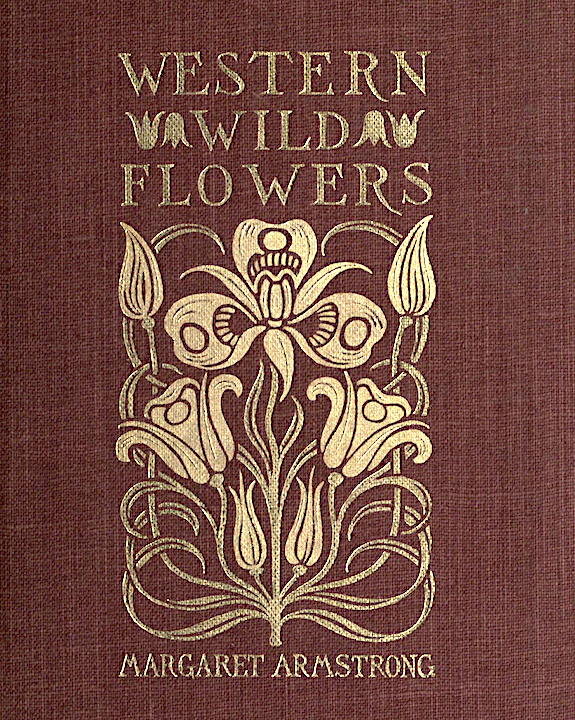 Field Book of Western Wild Flowers was published in 1915 (available online here). At first glance it might appear academic. It's organized by family, and includes a technical family key, genus as well as species descriptions, and a glossary of technical terms. Both common and scientific (Latin) names are used, the latter following accepted nomenclature of the time (5). Species descriptions address all relevant characters. Yet Armstrong intended the guide to be “mainly for the general public.” Toward that end, it was “fully illustrated” with 500 line drawings and 48 color paintings, all done by Armstrong from live specimens. And she didn’t restrict herself to dry technical descriptions. She added vignettes about the beauty, oddness, enchantment, and even danger that one might encounter in meeting these wildflowers. 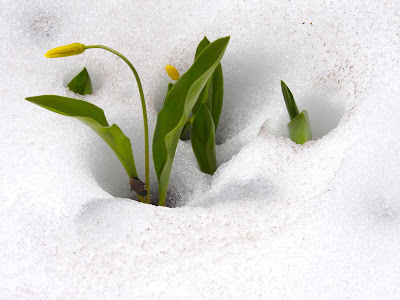 Erythronium grandiflorum pushing "right through the snow" (source). Indian Pipe, Monotropa uniflora, is “all translucent white, beautiful but unnatural, glimmering in the dark heart of the forest like a pallid ghost, mournfully changing to gray and black as it fades” (source). 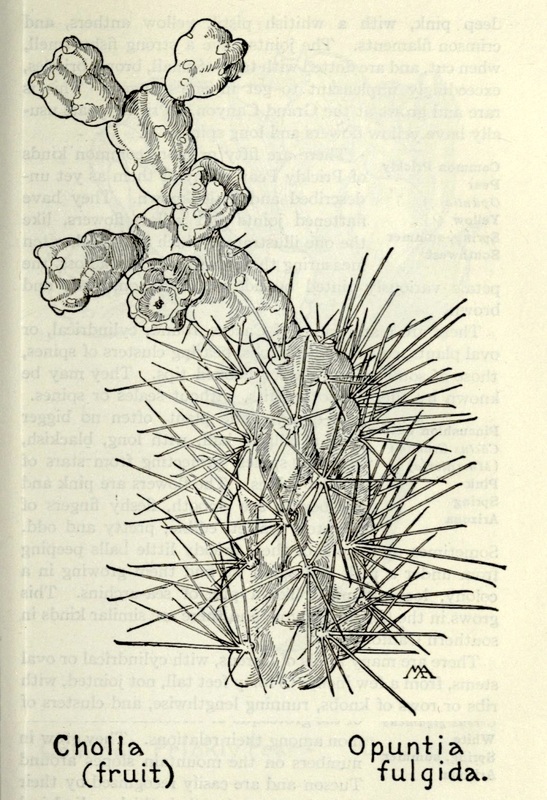 Armstrong was quite impressed by this cholla, Opuntia fulgida—now called jumping or chain fruit cholla, Cylindropuntia fulgida. 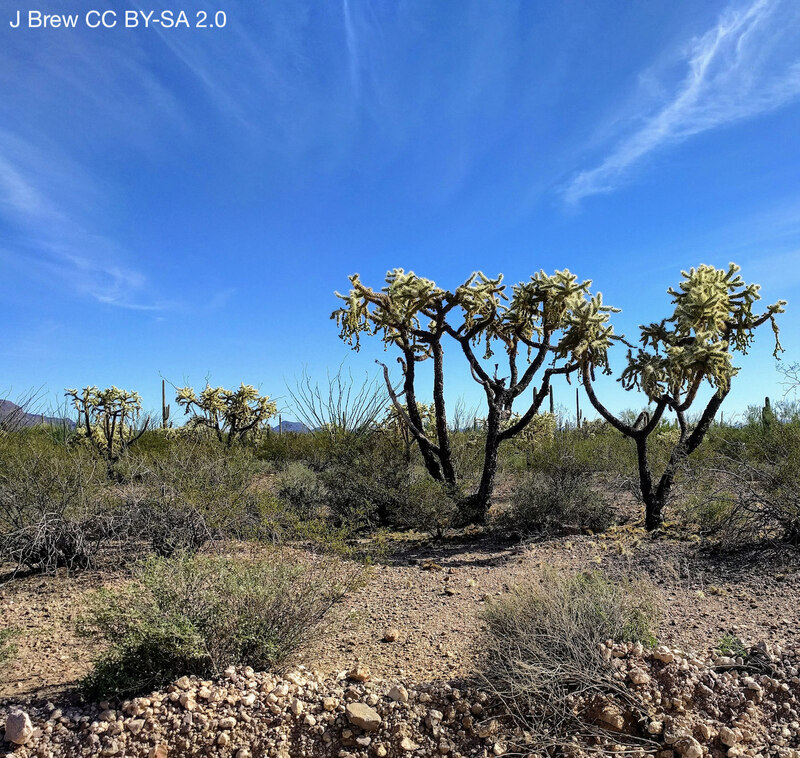 “A horrible shrub, or dwarf tree … The distant effect of this plant is a pale, fuzzy mass, attractive in color, giving no hint of its treacherous character more like a wild beast than a plant! The joints suggest a very ferocious chestnut-burr and break off at a touch, thrusting their spines deeply into the flesh of the unwary passer-by, so that the Indian story, that this plant flings its darts at wayfarers from a distance, might almost as well be true, and the barbs making the extraction difficult and painful.” (source). 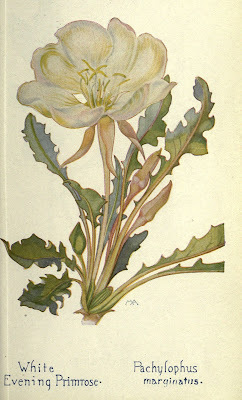 I learned of Margaret Armstrong and her wildflower book only recently, by way of Flickr where the color plates have been uploaded by Biodiversity Heritage Library. They’re available for download, are copyright-free, and have been tagged (partly by yours truly) so that they will come up in searches (scientific name, common name, artist name and more). If you’re looking for a fascinating citizen science opportunity, checkout BHL on Flickr for more information. (2) Armstrong had no formal training in botany. (3) Armstrong and her companions are sometimes referred to as the first white women to reach the bottom of the Grand Canyon. But from her account of the trip, it’s clear that others had gone before. 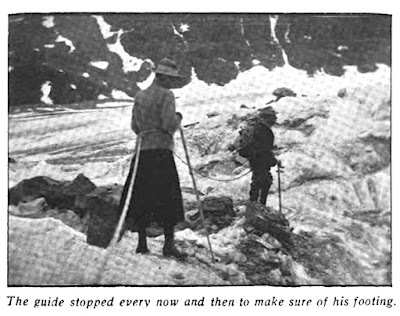 She included a story told by their guide of a female tourist who refused to ride back up to the rim, and had to be hauled out on a litter. 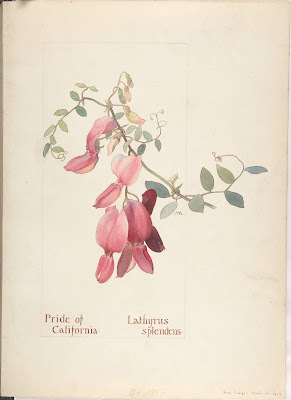 (4) In her Preface, Armstrong states that hers “is the only fully illustrated book of western flowers, except Miss Parsons's charming book, which is for California only” (Wild Flowers of California by Mary Elizabeth Parsons, 1900). She doesn’t mention Rocky Mountain Flowers by Frederic and Edith Clements, published in 1914—possibly too late to be noted in her book. In any case, Armstrong didn't include species found only in the Rockies. 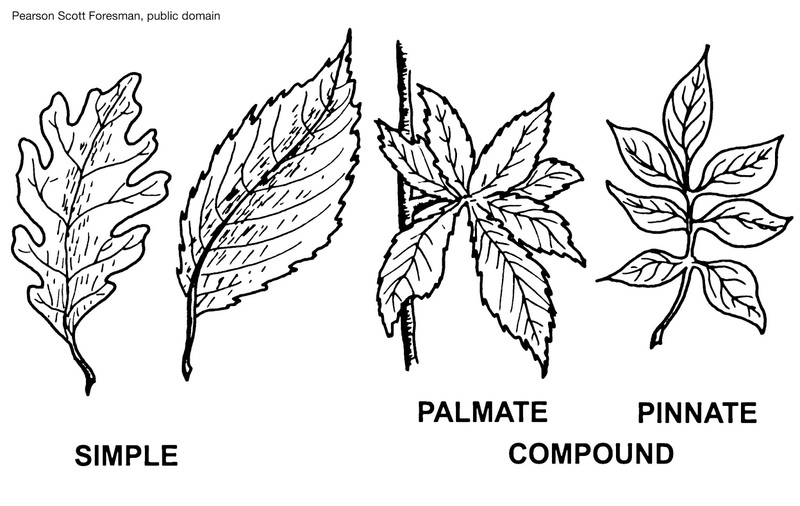 (5) Armstrong recruited a small army of botanical experts for help with identification and nomenclature. 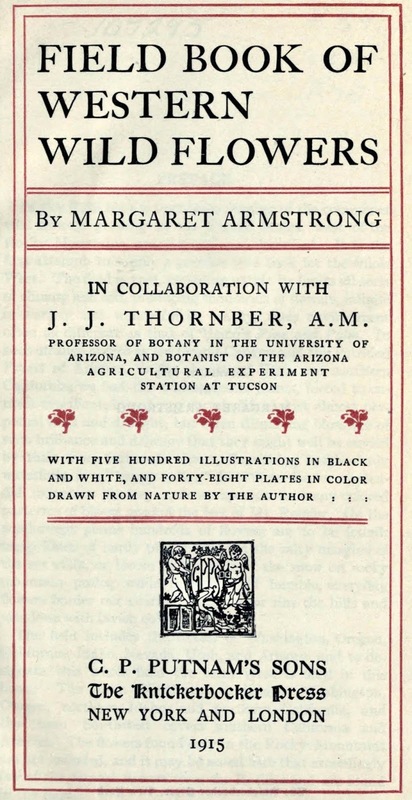 In her acknowledgements, she noted that “Professor J. J. Thornber, of the University of Arizona, is responsible for the botanical accuracy of the text and his knowledge and patient skill have made the book possible.” She thanked eight experts on the flora of the western United States for “most valuable assistance in the determination of a very large number of specimens …” and eight others for advice and assistance (including luminaries such as Alice Eastwood, WL Jepson, Marcus Jones and NL Britton). Armstrong, Margaret. 1912. “Canyon and Glacier” in The Overland Monthly ser. 2 v. 59. Available here courtesy HathiTrust. Armstrong, Margaret. 1915. 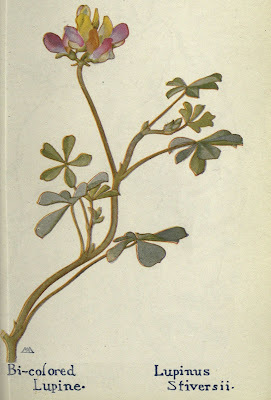 Field book of western wild flowers. London,C. [sic] P. Putnam's Sons. Available here courtesy Biodiversity Heritage Library.